From planning to unpacking, we’ve got your back. Let’s be honest—long distance moving can make you feel overwhelmed. It’s a big deal, and at Wheaton we understand that. As an interstate moving company, we are tasked with coordinating moves across state lines, and we work hard to ensure the process runs smoothly from packing to delivery. It’s why we’ll be at your side every step of the way, ensuring the move goes smoothly. Are you moving locally? Not a problem! You can still work with one of Wheaton’s local agents to move within state. Taking the time to make a plan helps your whole move unfold more smoothly. 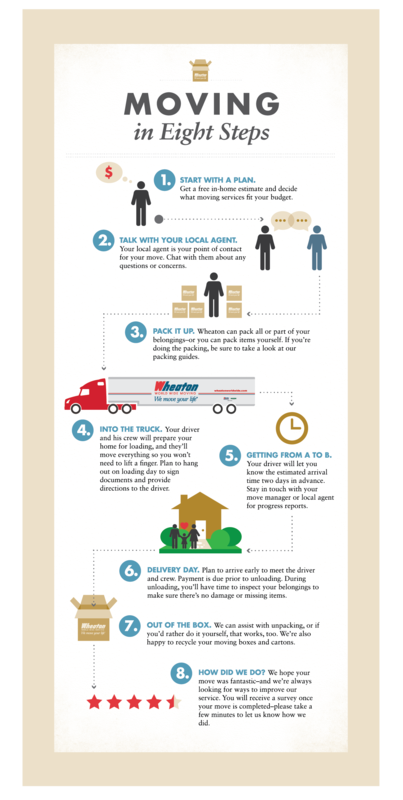 It’s always a good idea to book your move as far in advance as possible, and your Wheaton agent will get you started with a free in-home moving estimate. Ideally, this estimate will be scheduled at least five-to-six weeks ahead of your move, and you’ll want to choose your moving company at least four weeks ahead of your moving date. Your agent can also help advise you on what services you may need for packing and storage, and can help explain your valuation and protection options. Your move manager is your advocate at Wheaton, overseeing your entire move from start to finish. As your primary point of contact, your move manager will make sure your relocation is a smooth one by staying in constant contact with agents, the driver, and loaders. Move managers are also available to answer your questions. If you have customer service concerns, or need to file a claim, your move manager can help with that, too. Whether you use our professional packing services or you decide to pack things yourself with the help of our guides, packing things the right way is the first step toward ensuring they arrive safely at your destination. The time spent packing (and the materials used) will depend largely on the items you’re moving (especially if they’re unusual or specialty items, so it’s a good idea to schedule an in-home estimate to help determine your timeline. Our movers will load your belongings onto our truck, making sure everything is packed securely and safely, provided the driver deems your items safe to transport. The time this takes will depend largely on the size of your home, and the amount of items you’ll be shipping. We’ll label boxes individually, and verify the condition of all goods, even providing you with a detailed inventory before we load your belongings securely into our van. Your move manager can answer any questions you have about the progress of your belongings toward your destination, and we’ll provide you with a range of dates for delivery based on the distance we have to travel. Should you need more time, we do offer storage-in-transit to keep your belongings safe until you arrive at your new home. The tariff provisions require that all charges be paid in full before your shipment can be unloaded at your destination. We accept payment by cash, money order, traveler’s check, certified check, or cashier’s check. With prior credit approval, you can also charge the expense to your personal credit card. We gladly accept MasterCard, Visa, Discover, and American Express. At least 48 hours before the delivery of your belongings, your driver will contact you. It is at this point that you should make sure your driver has the right destination contact information, before he leaves your origin residence. When the truck reaches your destination, payment should be made before the truck is unloaded. At that time it is your responsibility to make sure there’s no damage to any of your belongings. You should also make sure there isn’t anything missing. We accept cash, traveler’s check, certified check, cashier’s check or money order for your move, and you can make payment at any time before the truck is unloaded. If you’ve been granted prior credit approval, you can also choose to pay by credit card. Wheaton accepts MasterCard, Visa, Discover, and American Express. Our packers can help you unpack and dispose of the cartons, or you can take the lead and settle in at your own pace. Either way, the unpacking process goes a long way toward making your new house feel like a home. We always want to hear from you with your feedback, and after your move we’ll follow up with a satisfaction survey to get your thoughts. Our goal is to make sure you’re completely satisfied, and we do that by providing excellent, attentive service. But if you have any concerns, we want to hear them. To learn more about any of the steps involved in planning your move, or to start working with Wheaton, please contact us today.